All the pieces composing Monet are interlinked, from the geometric base, composed of polished acrylic, to the top, which is made from polished brass. Product features: This sophisticated side table has an acrylic base, and a cast brass table top, with a unique surface texture. Arts and Techniques: Foundry, Soldering. 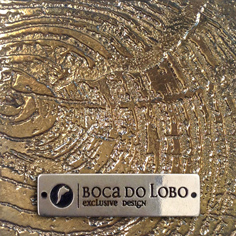 Product Options: Available in patina, copper or silver coat finishes. Influenced by the impressionist movement, and paying tribute to one of the era’s greatest painters, the Monet side table is a sophisticated furniture piece with a modern design twist. Featuring both contrasting shapes and materials, from a geometric acrylic base, to an organic surface made from cast brass, in a unique textured finish, the Monetis an exclusive furniture piece that stands out due to it’s perfectly balanced synthesis.